In 1989, at the height of the bubble economy, rural areas embarked upon resort developments and regional revitalization. In this period, Sunabi Museum began with a t-shirt art exhibition. Paintings and pictures printed on t-shirts were arranged on the sandy beach to dry like laundry. 1000’s of t-shirts were swaying in the ocean breeze against the backdrop of deep blue sky and sea. For the townspeople, this was the moment when the familiar sandy beach became an art museum. All the t-shirts on exhibition are designed by the public. This art exhibition is created by peoples’ imaginations. When the exhibition is over, the t-shirts will return to their creators along with the scent of the sea breeze. With new designs every year, and the amazing natural scenery, it is a once-in-a-lifetime experience. The people and the nature create a spectacular fluttering landscape that you will never get tired of seeing. Since the beginning of Sunabi Museum, it is the biggest event in Kuroshio Town and expresses the concept of the art museum the most. T-shirt Art Exhibition is biggest and most prestigious even in Western Kochi. However, the exhibition is only open 5 or 6 days around the beginning of May. We are sorry for it. But, there is another way to experience the concept of T-shirt Art Exhibition. 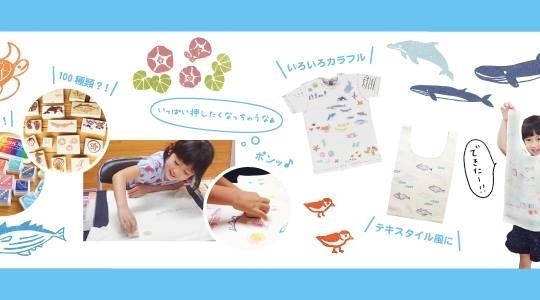 We can offer the chance to make your own T-shirt Art Exhibition by yourself through Sunabi Stamp workshop. We prepare T-shirts, which are same T-shirts used in T-shirts Art Exhibition made of 100% organic cotton, and several stamps. You can make your own T-shirts only one in the world. 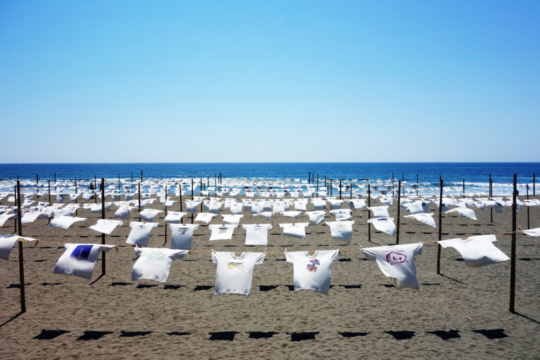 After making T-shirts, you can exhibit it on the beach in the same way of the exhibition. It is your “Private T-Shirts Art Exhibition”! You can also choose Eco-bag instead of T-shirts. Kuroshio has brought many things to this place since ancient times. Plants and animals, culture and technology, and perhaps the human beings that were our ancestors as well. Many things flow unto this beach even now. Unfortunately, most of it is treated as garbage. But here at Sunabi Museum, let us change our points of view. If you have a sense of the journeys that the things that have flowed here have taken so far, you will see countless stories. Every February, the Flotsam Exhibition that displays drift items is held. 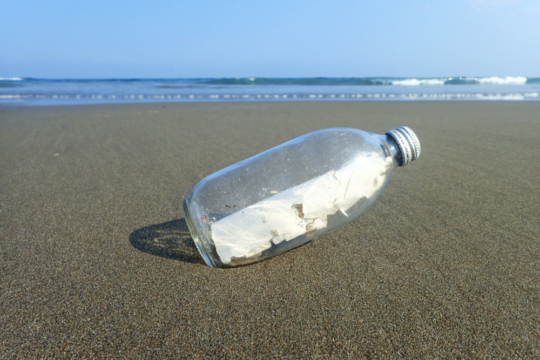 We also help you to experience the beach combing for yourself, which gathers the flotsam that will become works of art. 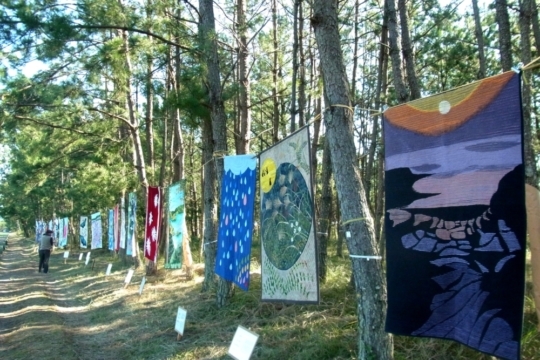 In autumn, Shimotsuki (November), the leek fields spreading out in front of the pine groves on Irino are covered with small purple flowers, and the Sea Breeze Quilt Exhibition is held. On the carpet of leek flowers surrounded by the pine groves, unique patchwork quilts made by people from all over the country are displayed. With the sun shining through the leaves, the patchwork quilts, made thoughtfully stich by stich, flutter in the sea breeze. The Quilt Exhibition at Sunabi Museum is something that could never be appreciated if you only stayed indoors.